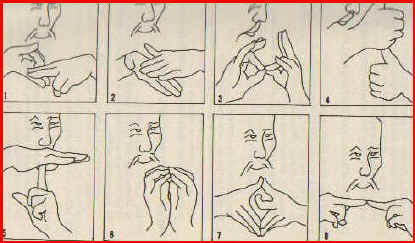 Mudras are ritual hand gestures. Classical Indian dance Bharat Natyam has a vocabulary of hundreds of these, but though they mainly play a narrative role in the dance as performed in public today, clearly they once served as a universal sign language in this region of such a variety of cultural forms. Some are static; others require movement to complete the sense. Some few are reserved for special purposes such as healing or tantric ritual practices that include Hindu worship and Buddhist ritual-practice [sadhanas]. The use of "magical" gesture is undoubtedly very ancient, and the mudras form an intrinsic part of worship that serves to provide a kinaesthetic expression and reinforcement of the mind's engagement in visualization, as well as a locus and channel for spiritual energy. In a practice, a ritual or sadhana, they also can provide cues to coordinate the congregation or participants. ~ fig. 17 from Beyer's The Cult of Tara (155) Moustache not essential ! The Supreme Knot (Skt: shri vatsya) often called 'endless,' or 'eternal.' The horizontal pairs of fingers make the crossing threads. We can make the traditional offerings of a ritual of symbolic or mental worship using gestures to stand for actual physical acts of generosity. Usually, the mudras work to enhance or underscore the acts of generosity. Some believe they have an actual effect on the environment in a way that is similar to mantras. Karma Kagyu Lama Kathy (Gyurme Chotso) demonstrates the offering mudras. *The Sanskrit word mudra has more than one meaning. In a ritual or tantric context it may indicate a divine manifestation that is, a symbolic form or embodiment as for example, one's consort, but it may also mean an attitude or an approach to an idea or state.